For those of you in the design profession and of a certain age (ahem) the above photograph will bring a wealth a memories flooding back. It’s strange to think that it wasn’t that long ago when our creative lives were ruled by a very different type of technology that involved hands on skills to create beautiful typography. What brought on this blast from the past? I’ve been on the hunt for some self adhesive colour film for an art project for the girl and went googling for Letrafilm. This was a product we used day in day out to create visuals and colour artwork. It was lovely stuff: gossamer thin, an incredible range of Pantone colours and a beautiful matt finish. On the downside, absolutely anything would stick to it, and usually did, messing up the painstakingly created artwork. Of course Letrafilm has gone the way of the dodo and was discontinued some time ago, so my search for the art project materials continues. 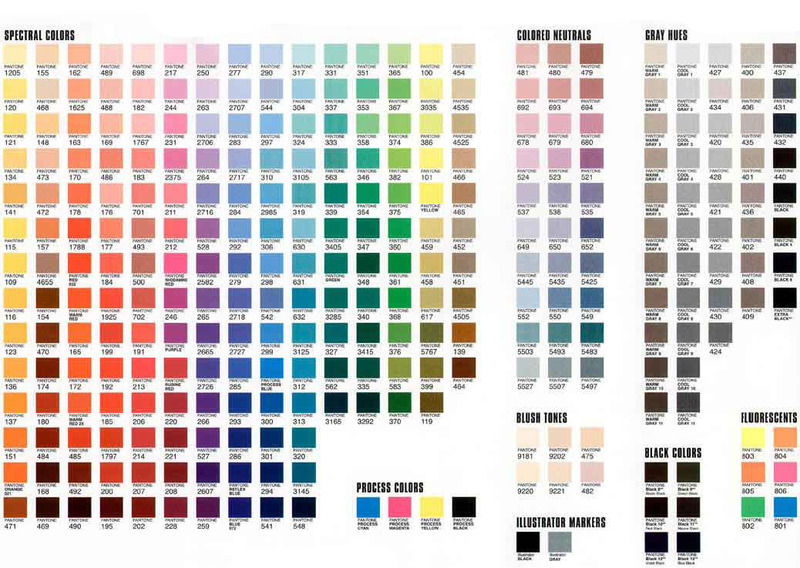 But I was reminded, when searching, how the Pantone products held a vice like grip across pretty much all of our working designer lives when I was learning my craft. 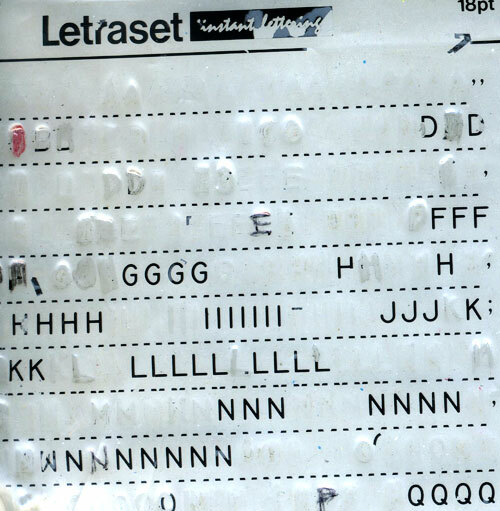 Letraset is the one most people outside the industry will recognise – we had cabinets full of the stuff. It was expensive too and there was much craft and skill involved in applying the delicate letterforms to art boards or high quality paper. 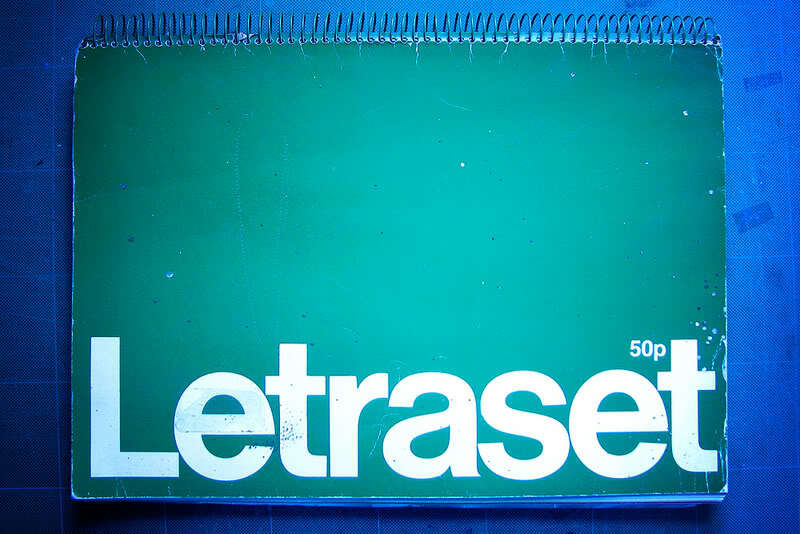 The Letraset catalogue was the first port of call when selecting a typeface and every studio’s copy was dog eared and well used. It was also a treasure trove of often bonkers fonts that defied belief. Then there was Letratint – essentially black ‘mechanical’ half tone tints that were used in black and white camera ready artwork, saving a lot of time and money in reproduction. Again, these were hellish to apply, requiring deft scalpel skills. I learnt my trade from a studio of ‘commercial artists’ – the precursors to actual graphic designers – and these guys were all about craft and knew every trick and shortcut in the business. I learnt fast. Then there was Letrafilm and Pantone paper – the former the self adhesive A4 sheets (hellishly pricey I seem to remember) and the latter, large A2 sheets of solid pantone colour (again, not cheap) but a lifesaver if you had to lay down a lot of colour in a design. They were prone to getting kinks in the paper when delivered I seem to remember. Twenty years ago it would be almost impossible to imagine the quantum shift that has taken place where the technology (predominantly Mac of course) has revolutionised our industry – slashing timescales, opening up design to a wider user base, making life significantly easier for designers to meet the requirements of the brief and their clients. Technology of course, is always a double edged sword and I couldn’t write a post like this without bemoaning the loss of craft though (you knew this was coming). Whilst the world in general races forward with innovation after innovation, changing lives irrevocably, I can’t help but thinking with the loss of things like Letraset, we’re losing more than rub down lettering. I found your blog via pinterest.com. As an ageing graphic designer, it did indeed take me back. All the vowels would go first and popular letters like R and S. Then you were left with sheet loads of Q’s and X’s. I used to take the Letraset catalogue to bed with me. Sad. Chuck into the mix a big sniff of cow gum and pantone marker and that would see you through to the weekend. Apple, bless ’em, are a little soulless in comparison. Bring back retro graphic design! I was a Technical Illustrator back in late 1980’s, earlier 90’s and I remember using the halftone self adhesive sheets. I am looking for some of these if anyone has any stashed away any where.? We do custom dry transfers. Happy to work with you.